I thought things were going well. I was stitching faster, so it should have been turning out better than that. Thankfully, I checked the back well before I had 2/3 of the block done. Out came the seam ripper again. Unfortunately, since I was stitching faster, those stitches were a lot smaller than Monday night's stitches, so it took longer to rip out. While I ripped out stitches, I remembered having this problem before, with one of my earliest feathers, when the bobbin was close to empty. So, I filled a new bobbin and tried again. It worked! No eyelashing here. The spirals still aren't perfectly shaped, but that's the whole point of a practice quilt, right? I finished 3 blocks and a whole row of sashing feathers, so now I'm working on vertical row 8 of 15. The funny thing is, I emptied the bobbin later in the evening, with no hint of a problem. Go figure. At least now I know to check the bobbin next time I'm having problems. I'll start with the good news this week. I have finished blocks 14 and 15 of my Golden Album Quilt by Jinny Beyer. Cutting the pieces for block 14 was challenging because I had to match up the pattern for the 4 pieces that make up the bottom of the T. Stitching it together went fairly well though. Block 15 has curved piecing. I had read about doing curved piecing, but I don't know if I had ever actually done it. I was pleasantly surprised by how easily it came together. Then I tried working on the FMQ for my scrappy log cabin quilt. That did not go so well. See all that crazy eyelashing? I had about 2/3 of a block done by the time I checked the back and discovered this mess. As far as I can tell, the eyelashing seems to happen when my hands are out of sync with the speed of the machine, mostly when I'm stitching slow, but still moving my hands fast. Sometimes I just can't keep my needle speed up. I'm going to try again either tonight or tomorrow night...hopefully that will go better. I also have most of the 73 pieces cut out for block 16. Yep - 73 pieces in one block that finishes at 10 1/8". I'll have pictures soon. Have you ever noticed that you know every flaw in every quilt you've ever made? Not only do you know exactly where the seams don't quite match up, but you also feel the urge to point them out whenever someone compliments your quilt. On the other hand, when you're admiring another person's quilt, you brush her off when she says, "But see this...I just couldn't get these points to match up." "No one will ever notice that," you tell her, and you're not saying it just to be nice. Usually the flaws are so small they aren't noticeable when you consider the quilt as a whole. With our own projects, we stare so closely at each individual seam that every mistake seems huge. We've never scrutinized someone else's quilts so intently though, so we're able to enjoy the overall effect of the pattern and fabric. We often have the opposite problem when it comes to our lives. We excuse our faults rather than examine them closely. After all, examining ourselves would force us to admit we're sometimes wrong. Rude. Lazy. Hurtful. Selfish. It's not pretty and we'd rather not think of ourselves that way. Unfortunately, we don't excuse the people around us so readily. Knowing this about human nature, Jesus said, "Do not judge, or you too will be judged. For in the same way you judge others, you will be judged, and with the measure you use, it will be measured to you. 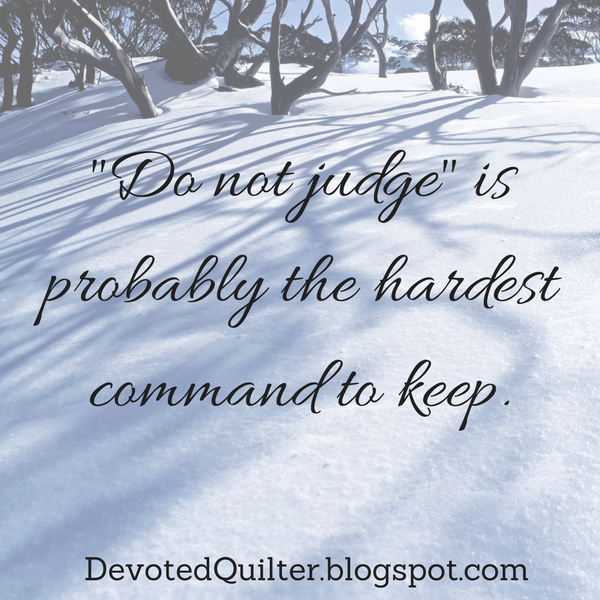 'Do not judge' may well be one of the most difficult commands to keep. Whether it is their social skills, their work ethic, their parenting or even their fashion sense, we often find other people lacking. While we may excuse our own bad mood as being the result of a lack of sleep or a headache, we may view someone else's bad mood as a character flaw. Jesus' advice is for us to adjust our focus, paying more attention to our own flaws. We're to examine our lives as closely as we examine our quilt seams. Perfection isn't possible this side of eternity, but with Jesus as our example and the Holy Spirit as our Counselor, we should be making improvements. When the center seams of a four-patch block don't match up, I rip out the seam and re-sew it. Unfortunately, I can't just undo the moment when I've said or done something wrong and do it over. All I can do is confess to God and apologize to anyone I have hurt. Then I try not to repeat the same mistake. That's 'taking the plank out of my eye.' To be honest, I hate ripping out seams. Apologizing can be even worse. In the end, though, both make for a better end result - either a better quilt or a better life. Just as I sometimes have to sew a seam a few times before I get it right, removing a 'plank' from my life isn't always a one-time thing. It takes vigilance to keep them from planting themselves all over again, causing my view of myself and others to become distorted. I know I need to pin spots where I want seams to match. Likewise, once I discover a 'plank,' I know to watch for that particular problem in the future. That doesn't mean I'm always successful, but at least I'm aware of the problem and trying to improve. What about you? Are you more particular about flaws in your quilts or in your life? Are you looking for 'planks' in your life as carefully as you look for imperfect seams? A quilt is beautiful when care has been taken to sew straight seams and match corners. A life lived trying to match God's standards is immeasurably more beautiful. I'm linking up today to the meet: My Machine party going on this week, hosted by Sew at Home Mummy and The Tilted Quilt. It has been so much fun reading about what machines other people are using. Here's my machine. She's a Kenmore, model 385.19110 (yes, I had to dig out my manual!). She was a Christmas present a couple of years ago when I wanted a machine with a few more stitches for doing machine applique. Specifically, I wanted a blanket stitch and I do use that one a lot. There are plenty of other stitches I still haven't tried. After I got her, I also ordered a walking foot and a embroidery foot for free-motion quilting. Those two feet have really changed my quilting. I used to do all my quilting by hand, which took forever. Now I can machine quilt, which takes a lot less time. Plus, I can play around with much fancier designs than I would ever have attempted by hand, again because of the time factor. I'm still learning, and having a blast. In the picture, my machine is set up on my sewing table, otherwise known as our kitchen table. It's a very hard working table, serving as snack space, homework space, art centre, sewing table and main eating table for our family of five. Only once have I declared an 'eating at the coffee table' supper because the quilt had taken over the kitchen table and couldn't be moved. That's not to say it won't happen again. This is the one kitchen cupboard I have claimed as sewing space, though a couple of board games have recently taken up residence (thanks Adam!). I have no illusions of being organized, though I can usually find what I need. Mostly I keep current projects in here, along with the basic notions. That yellow container on the top shelf holds my scissors, pins, rotary cutter, marking tools, etc. That big empty space on the bottom shelf is where my machine sits when not on the table. This steamer trunk, which originally belonged to my mother-in-law, sits in our family room and holds my dwindling stash. I've been making a lot of scrap quilts the last few years and only buying as needed. I have definite stash envy when I see shelves and shelves of neatly folded fabric on other blogs. Obviously some quilters are more organized than I am! And here's the inside view. As I said, not a hint of order to be seen. I'm slowly cutting the small pieces into more useable units so it will be even easier to make my scrap quilts. In the meantime, I do enjoy rummaging through this mess of possibilities. Thanks for stopping by to meet my machine. One of my many works-in-progress is Jinny Beyer's Golden Album Quilt. My husband gave me the fabric kit for my birthday, so in theory my quilt should look exactly like the one on the cover of the book. I say 'in theory' because this quilt is taking every bit of precision I can muster. While I'm having a lot of fun stretching my quilting skills, not everyone likes to tackle advanced patterns. Some find them too tedious, or they quilt to have time to relax without thinking too hard. There's nothing wrong with that. Quilting is supposed to be a pleasant activity, however you want to do it. Passing through levels of difficulty isn't required. As Christians, though, there are expectations placed upon us. New Christians need everything explained to them because they are only learning about Jesus, about salvation by faith and about living to please God. Gradually, these new believers should begin to study for themselves. All of us should read our Bibles and try to understand what we read. When we listen to a sermon or read a book about Christian living, we should compare the speaker's or author's views with what we understand from our own time reading the Bible. The Hebrew believers were stuck in spiritual infancy. They should have been moving forward to the place where they could begin teaching others because they had a firm grasp of the basics, but instead they still needed to be fed simple teachings about repentance, faith, baptism and more (Hebrews 6:1,2). Whatever your quilting interests, are you challenging yourself with spiritual matters? Do you read your Bible for yourself, asking the Holy Spirit to help you as you struggle to understand some of what you read? When you participate in a Bible study, do you look at the material critically to see if you agree with how the Scriptures are being interpreted? What sort of Christians will we be 5 or 10 years from now? Let's not rely on others to feed us the spiritual food found in God's word. As we read it, study it and nurture ourselves with it, we will grow in spiritual maturity. I have been making these totally addictive little flowers for a couple of months. Mostly, I just pick away at them when I have a few minutes, or pack them up to work on while we're driving. I don't actually know what I'm going to do with them yet...I just love making them! I do love what Sonja Callaghan calls her Hexie lily pad quilt and I think I'll head in that direction. I'm going to need a lot more flowers, though. We're planning a family vacation this summer that will involve days and days of driving, so that will give me plenty of time for stitching flowers. I've started stockpiling the basted hexagons, all ready to be put together. Each elastic-wrapped bundle holds enough hexagons for 2 flowers, except for one set that is still just a single. With only 9 flowers ready so far, I see lots of basting in my future. When I baste my hexagons, I just tack the corners down. I don't stitch right through the paper to the front so I won't have to remove the basting stitches when I'm done. One tedious step avoided. With no real flowers blooming here yet, at least I can play with fabric ones! I have so many works in progress, it's hard to pick just one to feature today. But since most of them are going to be in progress for quite a while, and I don't want to keep adding more projects, I better save the others for another post! I started this scrappy log cabin quilt back in the spring. I wanted an easy piecing project that I didn't have to spend much to start, and that I could eventually use to practice my free-motion quilting. I figured using all those 1 1/2" strips for a double bed size quilt would make a difference to my scrap pile, but the bin looks just as full as it always did. Don't know how that works! One of my very early practice pieces. Those feathers look pretty awful! or these pieces left over after trimming a finished quilt. Not perfect, but at least I can see improvement. But I got tired of fiddling around with practice pieces. I wanted to be working on a real quilt. It had to be big, so I'd have room to practice, and it couldn't be a gift for anyone, because the quilting would be far from perfect. So, this quilt will eventually cover our spare room bed. The FMQ still isn't perfect, but I am getting lots of practice. There are 7 vertical rows of blocks and 8 of sashing. So far I have finished 2 rows of the blocks and 3 of the sashing. I'm not very good at needle-turn applique. True, I only tried it for one project, and abandoned it before I even finished one motif, but I found the whole process tedious and I just didn't like how my work looked. Normally I enjoy hand work, but not needle-turn applique. I much prefer using fusible web and stitching either by hand or, more recently, by machine. I like the results I get with foundation paper piecing, especially when I'm working with small pieces. But I don't like removing all those teeny-tiny bits of paper when the block is finished. Sometimes I'll even avoid a foundation pieced block to get out of that chore. Obviously, there are many quilters who do enjoy both of these methods and it is wonderful that there are patterns to suit their interests. I know a quilter who finds rotary cutting her pieces to be extremely tedious. She likes quilt kits where the pieces are all pre-cut and ready to go. Another quilter likes simple quilts that can be put together quickly. Me? I love quilts with lots of pieces and detail. The great thing about quilting is there's nothing wrong with any of these preferences. However you like to put your quilts together, there's a place for you in the quilting world. Actually, the quilting community would lose a lot of its vibrancy if we all had to use the same methods all the time. I may not enjoy doing needle-turn applique, but that doesn't stop me from marveling at quilts made by others who do enjoy it. Writing to the Romans, Paul said, " We have different gifts, according to the grace given us. If a man's gift is prophesying, let him use it in proportion to his faith. If it is serving, let him serve; if it is teaching, let him teach; if it is encouraging, let him encourage; if it is contributing to the needs of others, let him give generously; if it is leadership, let him govern diligently; if it is showing mercy, let him do it cheerfully" (Romans 12:6-8). 1 Corinthians 12:4-6 says "There are different kinds of gifts, but the same Spirit. There are different kinds of service, but the same Lord. There are different kinds of working, but the same God works all of them in all men." There are so many ways to serve God. We can give money or time to help causes we feel strongly about. We can teach children's church or classes for new believers. We can bake treats for those who are sick or hurt or just need to know someone cares. Some people sing or play music. Some spend hours in prayer for others, while some look after all the nitty-gritty details of organizing church events. That doesn't even scratch the surface of all the options available to us. For every single person seeking to serve God, there is a way to do it. After all, if God gave us our gifts and talents, there must be a way to use them for His glory. Colossians 3:17 says "And whatever you do, whether in word or deed, do it all in the name of the Lord Jesus, giving thanks to God the Father through him." Applique, foundation paper piecing, log cabin block - all of these fall under the umbrella of quilting. Likewise, one person's roast beef dinner delivered to a new mom, another's efforts in the pro-life movement and another's song writing all come under the umbrella of service to God. Whatever your talents and preferences, there is a way to use them to serve God. Our task is to identify what we can do and then do it. As Paul said, "If it is serving, let him serve; if it is teaching, let him teach." In other words, whatever you can do - do it. God made you and knows you. He knows what you like to do and what you are good at doing. In fact, He gave you those preferences and abilities. Use them for His glory and honour. to 'hang it on the wall. There are dozens of patterns I'd like to make for no reason except that they're beautiful. Quilts with lots of flowers often fall into this category. As mom to three boys, I don't make many flowery quilts. As much as I love these quilts, I mostly stick to quilts with a purpose. What use is a quilt that stays hidden in a drawer or closet forever? It may be beautiful, but if it's tucked away no one gets to enjoy it. As Christians, we have a purpose. Our purpose is to be seen and noticed by all the non-believers around us. Jesus said, "You are the light of the world. A city on a hill cannot be hidden. Neither do people light a lamp and put it under a bowl. Instead they put it on its stand, and it gives light to everyone in the house. In the same way, let your light shine before men, that they may see your good deeds and praise your Father in heaven" (Matthew 5:14-16). Our purpose as followers of Jesus is to shine light into the dark world around us. How do we do that? Every act of honesty counts, even something as small as pointing out when an oblivious shopper drops a five dollar bill. So does every time we refuse to gossip or every time we go out of our way to be pleasant or helpful, especially in situations where others wouldn't be. We live in a small town of about 1400 people. We didn't grow up here, so I'm still piecing together who is related to whom, even after more than 7 years. You can be sure, though, that many people know who we are simply because we were once new in town. New people always get noticed. Many people also know we go to church, in part because my father-in-law was pastor here before we moved to town. Though my in-laws had moved away before we arrived, for our first few months in town we were often introduced as Pastor Parsons' son and daughter-in-law. In a sense, we are like a quilt on display rather than tucked away in a drawer. How we interact with the people in town impacts how they view Christians, which in turn impacts how they view Christ. Obviously, we're not the only Christians in town; we're not even especially prominent members of the community. Having said that, if we were often rude with store cashiers or the town's workmen or the librarian, you can be sure it would be noticed. Jesus also said, "All authority in heaven and on earth has been given to me. Therefore go and make disciples of all nations, baptizing them in the name of the Father and of the Son and of the Holy Spirit and teaching them to obey everything I have commanded you" (Matthew 28:18-20). We are not supposed to keep our faith to ourselves, hidden away in the bottom drawer of our lives. Jesus expects us to be open about our faith, to tell others about Him, to live in a way that brings honour to His name and that points others to "the way, the truth and the life"(John 14:6). Are you fulfilling your God-given purpose, or are you more like a beautiful quilt stuffed into the closet and never seen again? Let your light shine in your home, your workplace, and every other part of your life. We may never know how our Christian living has impacted people around us, but we can be sure that God will use it. Coffee quilt designed by Karla Alexander - it hangs on our living room wall. That song from The Cat in the Hat Knows A Lot About That has been going through my head whenever I thought about what I would write for this first post, so it seemed only right to start with that. If you don't watch TV with a preschooler, you probably didn't get the tune, but that's okay. This blog will be all about my obsession passion for quilting and the way that I can relate quilting to anything else, particularly the Bible and being a Christian. Here are a few of my current works-in-progress. I'll share details of each of them in future posts. For now, I'm glad to have the adventure started.